I’m not sure exactly when it happened, but I’ve recently become a huge fan of the hand-me-down. I’ve never been adverse to a bit of second hand – our dining room table was once one of Mummy and Daddy Hatchy’s wedding presents, for example, and one of my favourite possessions is my replica Bush vintage radio, bought at our local car boot sale for £4.00 – but since falling pregnant, the whole hand me down thing seems to have ramped up a notch. 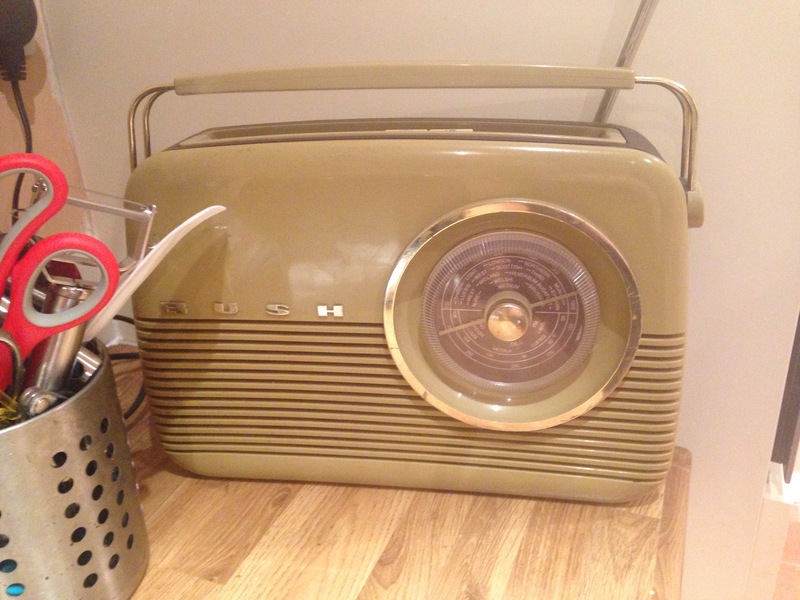 I adore my replica Bush retro radio! It started with my maternity wardrobe. Anyone that’s ever been pregnant will know that as lovely as it is to see your body blooming, it’s bloomin’ depressing having a body that limits your wardrobe to leggings and your stretchiest of long tops – and even those won’t stretch much beyond 20 weeks, if your bump is anything like mine was. Anyone that’s ever been pregnant will also know that maternity clothes retailers are few and far between, and tend to charge a small fortune for their wares! I invested in a few pretty dresses as I was pregnant over the Christmas party season and a few pairs of work trousers and jeans, then despaired as I slowly outgrew everything else in my wardrobe. Luckily, two of my friends came to my rescue. They were both lovely Louises, giving me various bits and pieces. Some pieces from one Louise had even been worn by her boss before her, and another friend after her, so they came to me fourth hand but still in great condition as maternity wear is worn for such a short space of time! 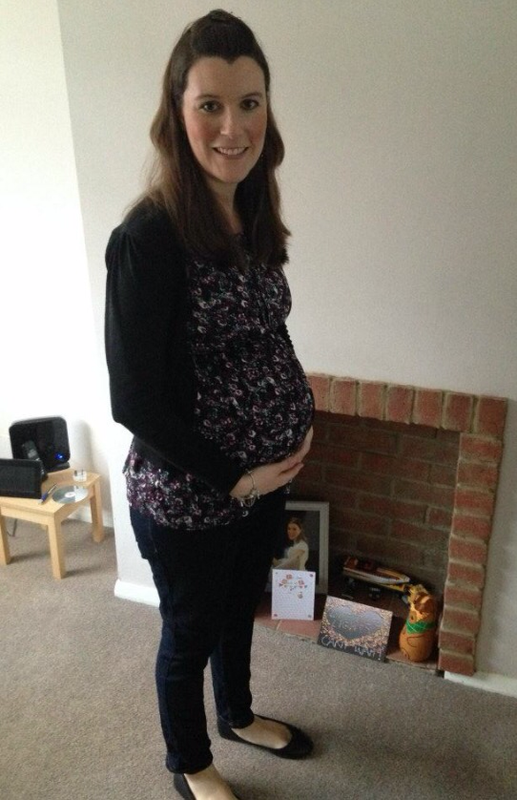 Mrs Lighty wearing the same top at 31 + 5 weeks pregnant! 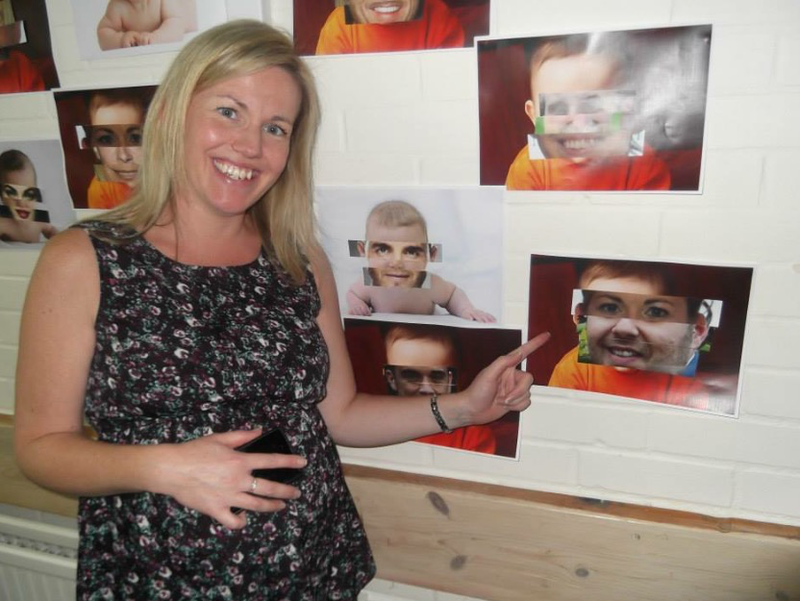 Maybe this is where the hand-me-down baby obsession started, but whilst I was pregnant, we started visiting lots of nearly new sales, such as the Mum 2 Mum Markets, and our local car boot sale in Dunton, Essex. We also scoured charity shops, and managed to kit ourselves out with lots of bits and pieces such as our nappy bin (a real bargain at £5.00 including three cartridges!) and our bath seat (£2.00 from our local charity shop). eBay was also a great resource, and we managed to source our Bumbo seat from there. We took the view that as these things are used for such a short space of time, there’s no point in paying full whack for them. What’s more, anything plastic is easily wiped clean – or, if you’re anything like Mrs Lighty, put in the dishwasher – and anything fabric can go in the washing machine. 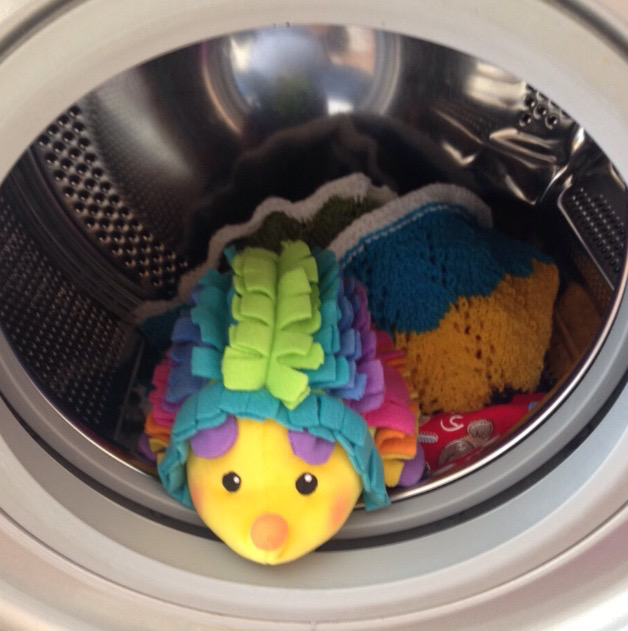 One of my favourite second hand buys going in the washing machine, Mr Rainbow Hedgehog! 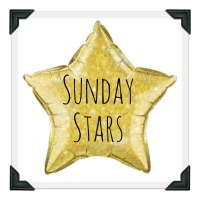 We’ve also been lucky enough to have been given lots of different things from family and friends – one of the perks of being among the last of our friends and family to have children is that we’ve been given everything from playmats through to baby carriers and even our Moses basket rocking stand. But by far and away my most favourite thing to receive are the pre-loved clothes. Is there anything more satisfying than being given a bag of much loved baby clothes to sort through? I love the excitement of seeing what cute outfits are waiting for me! I’m definitely not too proud to dress Baby Lighty second hand, and I love the fact that because some of our friend’s children are 5 or 6 years older than Baby Lighty, the clothes that those friends have given us are different to the ones that you can get in the shops now. I’m so enjoying playing dress up with my little hand-me-down baby, and who knows, if we go on to have a little brother or sister for Baby Lighty, these clothes might well be loved again! 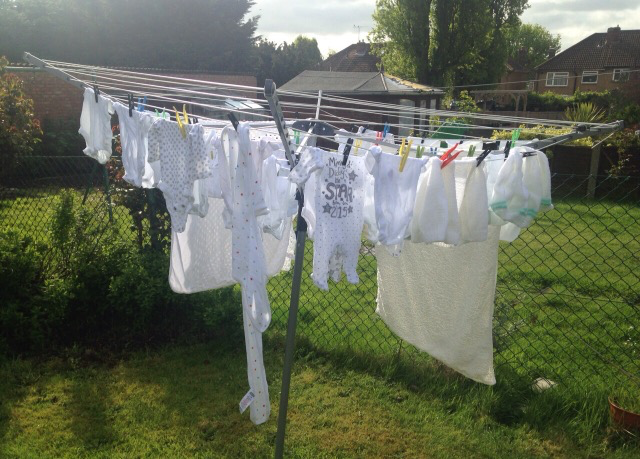 Baby Lighty’s clothes on the washing line before his arrival, many of which were much loved by friends and are now much loved by me! Both my girls wore their hand-me-down clothes from their two cousins, so soke pieces had been worn by four little girls in total. I don’t think it matter too much when they are little and growing so fast, but when they get older and start to develop their own taste in clothes I think the hand-me-downs will stop. I imagine when mine get to teenagers they will start “borrowing” each other’s clothes!